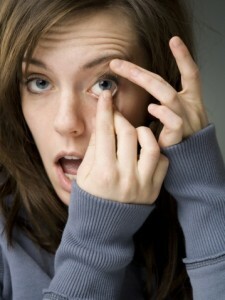 Contact lenses can provide wonderful freedom to see clearly without the need for spectacles. Costing less than a latte per day, everyone can experience the benefits even just once a week. The gold standard in contact lens wear is now single use daily disposables eliminating many of the traditional problems associated with contact lens wear. They are available to suit almost all prescriptions including multifocal and astigmatic corrections. Our Optometrists are highly skilled in contact lens fittings and will provide you with trial lenses and expert instruction on insertion and removal and use the latest technology lenses to suit your needs. Vicky Tranis is also trained in Orthokeratology contact lens fitting. Orthokeratology lenses are worn at night during sleep so that the patient can see clearly during the day without need for any spectacles or contact lenses. We carry stock of many popular brands of contact lenses and will post supplies to you for your convenience.